Choose: Size King Queen Twin Full Cal King Twin XL Full XL Choose: Mattress Height 9" 7.5"
The Protect-A-Bed® Bed Bug Proof Box Encasement is designed to provide ultimate protection against allergens and bed bugs when combined with an AllerZip® mattress cover. The encasement provides complete protection for a healthy and bed bug free zone. It features BugLock® three-sided zipper and AllerZip® seal gives total protection. The Protect-A-Bed Bed Bug Proof Box Spring Encasement Twin Size has many exciting features for users of all types. See the Protect-A-Bed Bed Bug Proof Box Spring Encasement Twin Size product video and gallery images above for more details. 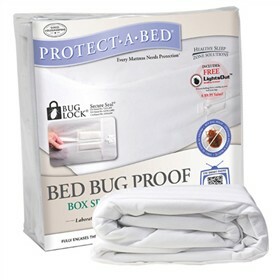 The Protect-A-Bed Bed Bug Proof Box Spring Encasement Twin Size is sold as a Brand New Unopened Item.